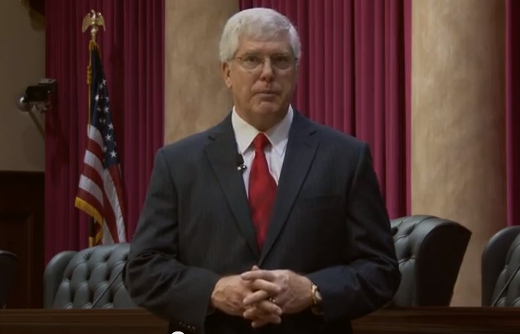 Liberty Counsel founder and chairman Mat Staver lashed out at New Jersey's ban on "ex-gay" therapy for minors, falsely claiming that the ban is rooted "not in science," but "in ideology," and blasting supporters of the law for advancing the "gay agenda." In an interview with NJ Today's Mike Schneider, Staver framed the ban as "an intrusion into the counseling/client relationship that is unprecedented in nature." Although Gov. Chris Christie cited an American Psychological Association (APA) task force report in signing the ban, Staver asserted that the APA had even found benefits to "ex-gay" therapy programs. There is no research demonstrating that providing [sexual change orientation efforts] to children or adolescents has an impact on adult sexual orientation. The few studies of children with gender identity disorder found no evidence that psychotherapy provided to those children had an impact on adult sexual orientation. There is currently no evidence that teaching or reinforcing stereotyped gender-normative behavior in childhood or adolescence can alter sexual orientation. We have concerns that such interventions may increase self-stigma and minority stress and ultimately increase the distress of children and adolescents. One study reported that 92 percent of former "ex-gay" therapy patients reported experiencing psychological harm due to the treatment - a finding that's far from surprising given the humiliating and cruel techniques such therapy regimens employ. Apparently oblivious to the irony of his own words, Staver expressed concern for the "ex-gay" counselors and patients whom the law allegedly "stigmatizes." According to Staver, "[t]his is simply a gay agenda and it hurts counselors and it stigmatizes them and it stigmatizes the clients who seek this kind of counsel." It seems that Staver didn't consider the possibility that the social stigmatization of LGBT people is what leads them to seek such counseling in the first place. Staver is convinced that "ex-gay" therapy can work, as he believes that LGBT people are not "born that way," citing the APA's statement that sexual orientation can be influenced by a number of "genetic, hormonal, development, social and cultural influences." While Staver may wish that this meant that sexual orientation is a switch that can be flipped on and off, the APA makes itself quite clear on the subject: "[M]ost people experience little or no sense of choice about their sexual orientation." Instead of addressing the bigoted homophobia that drives adolescents to seek "ex-gay" therapy, the head of the rabidly anti-LGBT Liberty Counsel would rather continue to shame LGBT people and their "agenda" of protecting children from discredited and damaging "therapy" programs. Liberty Counsel: Teaching Students About LGBT People Is "Sexual Assault"
Liberty Counsel's Barber: Simply Acknowledging LGBT People Exist Promotes A "Repugnant Message"
Liberty Counsel's Staver: "How Are You Going To Tell The Difference" Between A Man And A Transgender Woman?